When faced with severe weather, a checklist of to-dos starts to form: make sure the animals are safe, locate supplies in case the power goes out, fill jugs of water and maybe even head to the basement or lowest level of the house if necessary. But, what about when weather is so severe it might not be safe to stay in your own home? 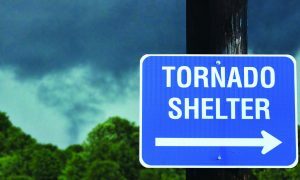 For residents of tornado-prone states like Oklahoma, Arkansas, Kansas and Iowa, there might be another option: a public storm shelter, sometimes known as a community safe room. These rooms or shelters are designed to withstand extreme wind pressures and debris impact. 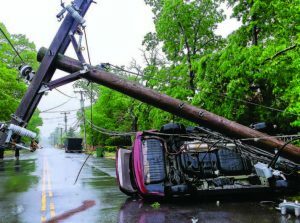 According to the Federal Insurance and Mitigation Administration’s “Community Safe Room Fact Sheet,” most businesses and public buildings, even new ones constructed adhering to current building codes, do not provide adequate protection from tornadoes, hurricanes and other extreme windstorms. Community safe rooms can provide near-absolute protection for many community members and in recent years have become popular options for many communities. For the most part, the decision to build a safe room is left to individual communities, and a number of factors can play into that choice. Potential for loss of life or injury, type of hazard, likelihood of use, occurrence and severity of weather and vulnerability of community members are just a few reasons why communities might opt for one. However, there are some areas required by building code to construct storm shelters. These areas typically include schools, 911 call stations, emergency operation centers in addition to fire, rescue, ambulance and police stations. 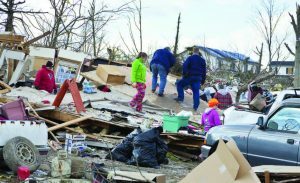 While FEMA has no official stance on whether cities should have public storm shelters, the organization’s Hazard Mitigation Grant Program provides money for safe rooms, storm shelters, sirens and other preventative measures. 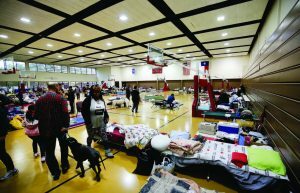 A public shelter might sound like an ideal situation: being in a safe environment, knowing families and friends are accounted for and being surrounded by emergency personnel — but not everyone is on board with the idea. In an interview with the Wichita Eagle, Acting Director of Emergency Management for Sedgwick County Cody Charvat said the cons of storm shelters outweigh the pros. Charvat also cited a 1979 tornado in Wichita Falls, Texas, during which residents left their houses, where they were safe, and headed to a public shelter; they were killed en route. A number of similar examples can be found from across the country. Oklahoma City Emergency Manager Frank Barnes echoed Charvat’s statements. “One of the issues of traveling to a public storm shelter is just that you’re traveling. You have to get in a car and drive somewhere, and being in a car is the worst place to be in that event, it’s not survivable,” he said in a May interview with Fox25. However, in the town of El Reno, Okla., home to 18,000 residents, everyone has been able to make a public storm shelter work. According to a Fox25 story, the public shelter can house about one-third of the town’s population and were constructed following a devastating tornado in 2013. The shelter opens for tornado watches and warnings and is designed for people who might not have a safe place to go. Overwhelmingly, officials stress the importance of homeowners having a safety plan in the event of extreme weather. In tornado-prone areas, storm safety should be a factor in choosing a home to buy, ensuring a space is available to remain safe.